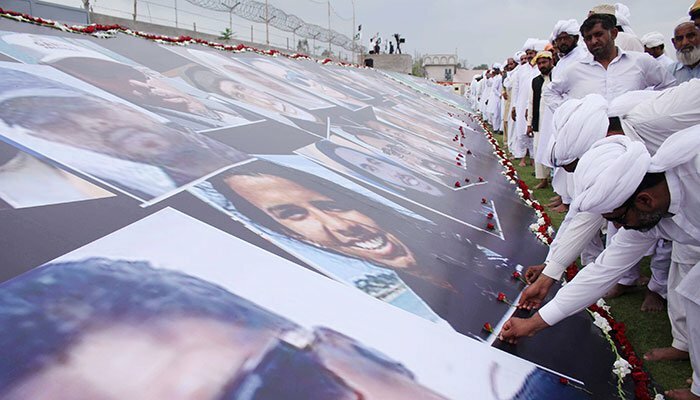 JHANG: Thousands of Pakistanis clad in white gathered in the central city of Jhang Friday to make a human image of Christchurch’s Al Noor mosque, where 50 people were killed by a white supremacist four weeks ago. Huge New Zealand and Pakistani flags were also displayed along with a giant banner that read: “Solidarity with the martyrs of Christchurch from Pakistan”. Her response “not only soothed the wounds of Muslims but also assured them that Muslims in their country are safe,” said Sahibzada Sultan Ahmad Ali, a religious scholar and one of the organisers. “We worked really hard to make this model,” one participant, Noor Hassan, told news agency AFP of the tribute. “It was so pleasant that we were ready to stand like this for the whole day,” he added. Hey Buddy!, I found this information for you: "Thousands of Pakistanis form human chain in image of Christchurch mosque". Here is the website link: http://en.dqudrat.com/2019/04/13/19231/. Thank you.